Corn Aloo Tikki with RiteBite Max Protein 7 grain snack! Indeed, very true! Our body and health is of utmost importance to us than anything else because if they are affected, our entire life, however good it must seem, would turn upside down, agree? I’m sure everyone would. With today’s fast-paced life, we usually resort to fast foods which silently affect our health. So why not stick to home-made food? One is then, at least aware of the products that go in the making and they can also take care of the hygiene, which is another important factor to consider for your health. Hence, I’ve come up with a great recipe that one can make with RiteBite products. 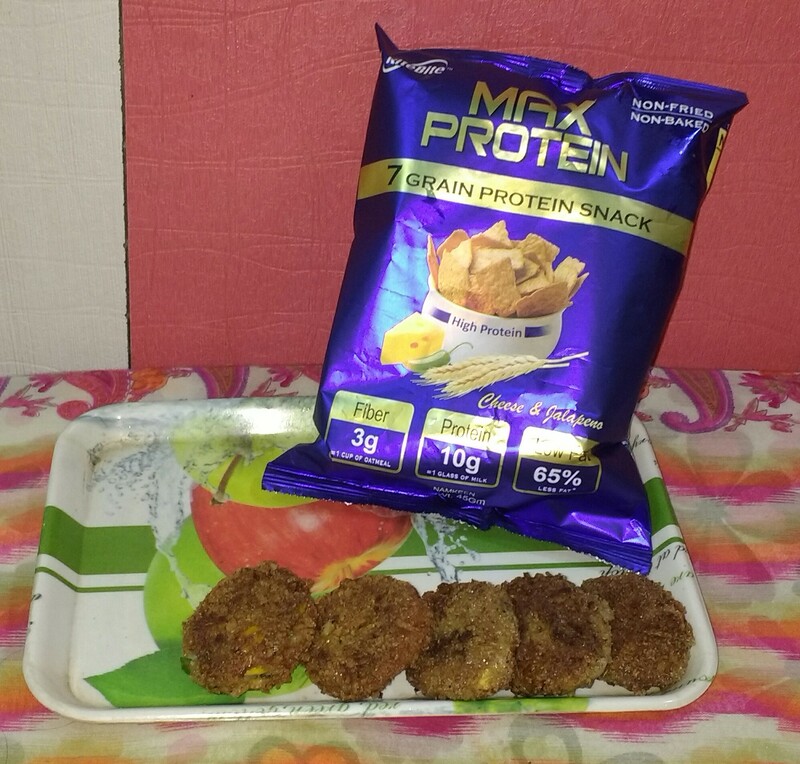 RiteBite Max Protein provides us with healthy snacks which are a best replacement to those unhygienic fast foods or on-the-go products. I’m incorporating the RiteBite Max Protein 7 Grains Protein Snack (Chips) and prepare a healthy recipe from it. Why RiteBite Max Protein Snack? We are going to prepare Corn Aloo Tikki. Add finely chopped Green Chili and coriander leaves to it. Further add Garam Masala, Chaat Masala and Salt to the mixture, as per your liking. Add the steamed Corn to the mixture. Blend well and start making medium sized tikkis from the mixture. Dip the tikki in the beaten egg mixture and then coat them well in the finely crushed RiteBite Max Protein 7 grains snack. Deep fry the tikki till golden brown. Follow the same procedure for all the other tikkis. Your crispy Corn Aloo Tikki is ready to eat. You can also use Coconut chutney or Tomato sauce for extra taste. Aren’t they simply delicious and healthy? I have loved making them and also enjoyed eating this healthy evening snack which is not only rich in proteins but also gives me the pleasure of a snack. How you liked the recipe? Isn’t it a healthy evening snack? Share your opinions in the comment section. Previous Previous post: The top 5 Indian Ethnic Wardrobe Essentials for the Wedding Season! Next Next post: How to Buy Grocery Online & Save Money!